Two Jens are more fun than one! Pals Jennifer Aniston and Jennifer Meyer got lensed for The Hollywood Reporter’s new cover by Miller Mobley, which centers on Hollywood’s top 20 red carpet designers of 2017. Some of the major names on the list include…Zoe Kravitz with Oscar de la Renta’s Laura Kim and Fernando Garcia, Evan Rachel Wood with Joseph Altuzarra, Kristen Dunst with Rodarte’s Kate and Laura Mulleavy, and Olivia Wilde with Rosie Assoulin. In the interview, Aniston revealed that Meyer made her all-time favorite piece of jewelry: her wedding band from husband Justin Theroux, who she tied the knot with in 2015. “It’s the one piece I never take off,” she said. 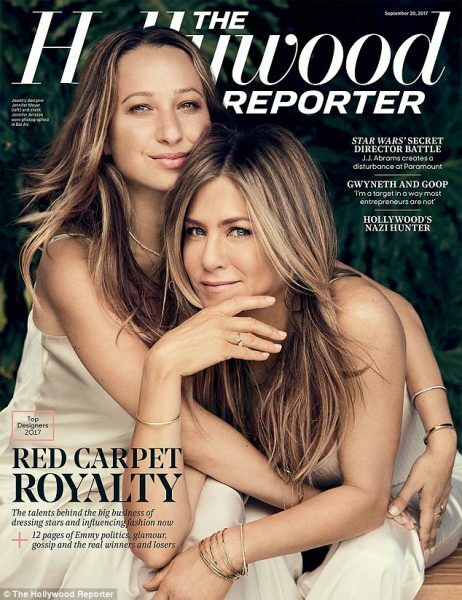 “People want a little piece of what these women have to offer, so yes, it’s 100 percent good for business,” the jewelry designer told The Hollywood Reporter. Meyer added that she only saved $7,500 to launch her business, which is beloved by stars like Reese Witherspoon, Jessica Alba, and Gwyneth Paltrow. All designers who made the cut, listed in the issue in alphabetical order, were selected based on prevalence of red carpet hits during the Oscar and Emmy seasons, magnitude of star power they attract, and social media presence. As for what Aniston’s up to these days? She’s filming Dupmplin’ with Luke Benward as well as putting a TV project together with Witherspoon, who just came off HBO hit Big Little Lies.